To my little surprise, I don't often visit that many French restaurants in Los Angeles. Not one bit at all. I actually needed to check on list of cuisines on the right hand side column to verify. To some degree, I think I attribute to my lack of institution of what constitute as a French cuisine. Often times I think I get confused with provincial dishes or classic comfort food as French dishes. To this day... I still thought French Fries are what the French are known for. Yes, shame on me. 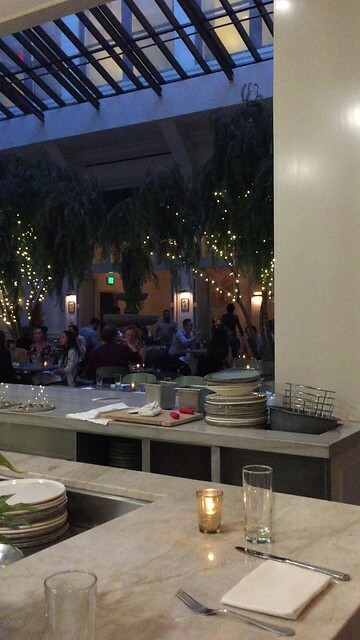 My introduction to Spring was made by an old acquaintance, a French restaurant situated in the bottom floor of the Douglas Building in downtown Los Angeles. A building many in LA considers to be a "Xanadu" for some of the wealthiest back in the olden days. The old acquaintance and I met up at the bar in front of the dining room. It's quite a cozy parlor room that has a great view of the corner street of 3rd and Spring. To get to the fabulous dining room, you would just need to hit up the hallway like it was a speakeasy. Let me tell you, once you get into the dining room, the center of the room has a breathtaking view of the skylight. Like a tree in the view of a park! Even though I came in for dinner, I feel like a brunch would be perfect situation especially with the daylight beaming down in the middle of the room. At the very first occasion, we decided to get the tasting menu to see how the dishes were set up. To my astonishment, I think some of these seasonal dishes were the most beautifully dishes ever presented. So Instagram-able worthy in fact. The dishes were concocted based on the ingredients available for the chef to create with his imaginative presentation that was out of this world. In many instances, I was in awe from dish to dish, all the way to the dessert. I think in my first visit, the hamachi crudo and the maple leaf duck breast was the stand out dishes on the tasting menu. This actually got me excited in wanting to go back and tried out their other main courses. The one dish that people seemed to rave about was the lamb sirloin, which was a fine dish itself. I personally love the desserts that creatively was some of the highlights at this fine establishment. Beautifully presented, great atmosphere & vibes, and delicious dishes as well. My only beef was that I think they can do better in certain aspect of their services. I know this is not a place to rush people in and out, but I think improvements can be made where attentions to details can be acquired. That will be saved for people writing a Yelp type review, but I do think this is classy elegant restaurant that does strives to be on the top of French restaurant. I do hope some kinks can be worked out as I do love coming to this restaurant. Especially on how tough LA can be, this restaurant do stands out as one of the best French cuisine restaurant in LA.